One of this centuries greatest architects, Lord Norman Foster, the brainchild behind revolutionary airport designs such as London Stansted, Hong Kong International Airport and Beijing’s new airport, has teamed up with architect Fernando Romero, FR-EE (Fernando Romero Enterprise) and NACO (NetherlandsAirport Consultants) to design Mexico City’s new international airport. “At 555,000 square metres, it will be one of the world’s largest airports. 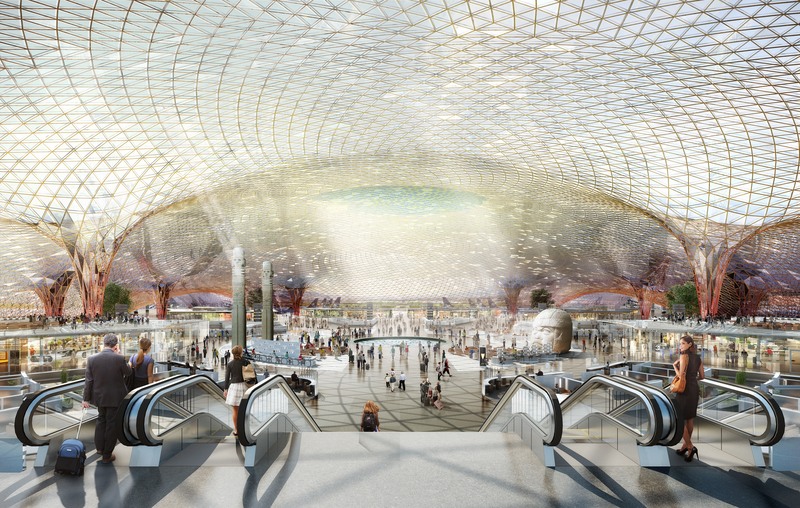 Conceived with Foster + Partners engineering team, the project revolutionises airport design – the entire terminal is enclosed within a continuous lightweight gridshell, embracing walls and roof in a single, flowing form, evocative of flight.” state Foster + Partners in their latest press statement. And what a roof. The most revolutionary part of this structure, is that it contains very few columns to support a never ending fretwork of celling panels, creating a fluid and breathtaking form, making the airport more of a destination that the journey itself. Not only is this a beautiful and awe-inspiring structure, it has merits to be proud of that go beyond the aesthetic. The stunning and elegant must-watch video showcases the space, how it can best be utilised, and how it will in effect be centre stage for Mexico, with the project bringing thousands of jobs, and potential for millions of tourists into the region, making the airport an efficient hub alternative for tightly packed and archaic airports in the US. There are limitations to the use of the airport as a hub, due to the incredibly high nature of the airport (some 7,000ft in height) meaning airlines have to consider performance out of this behemoth of a city. That said, the airport is designed for expansion, with a twin terminal eventually being built next to the primary terminal, with its own runway construction, meaning easier traffic management of taxiing aircraft. The airport itself is built by numbers. 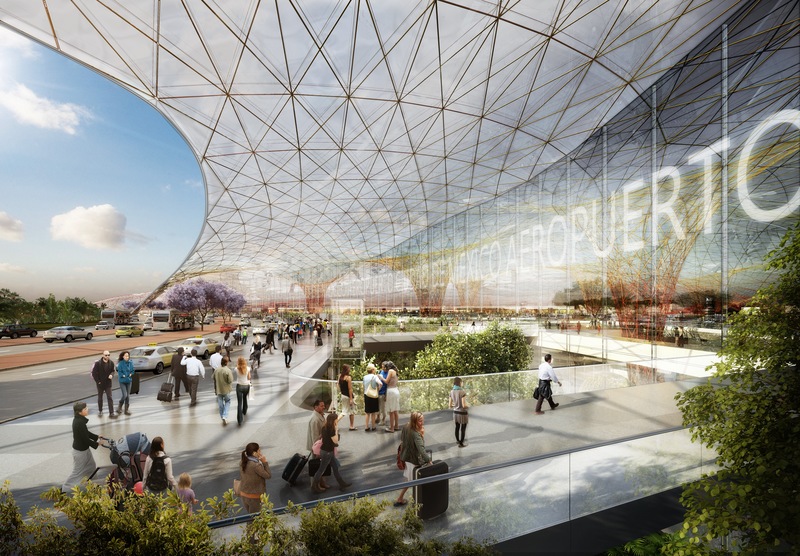 The new construction will be created by utilising spans in excess of 100 metres, three times the span of a conventional airport, inspired by the monumental size of traditional Mexican architecture and symbolism. The maximum span internally is a phenomenal 170 metres. But this isn’t just showmanship, it was a solution to Mexico City’s challenging soil conditions. The lightweight glass and steel structure and soaring vaulted roof are unique by being created using a pre-fabricated system allowing rapid construction without the need for scaffolding. The airport will be a showcase for Mexican innovation, built by Mexican contractors and engineers. It will stand 45 metres high at its highest point, featuring up to 4 levels. The terminal will be created using composite deck slabs and steel columns internally and a steel gridshell, externally. The terminal will cover approximately 470,000 square metres. We love this terminal, and certainly has Lord Fosters design stamp. The spaces he create are increasingly beautiful, intelligent and responsive to an ever changing passenger experience. And secretly, we are most excited about the air-bridges, which have finally been considered as an integral part of an airports design. We hope these beautiful and considered additions remain in the final construction. WOW…a SUPER, MEGA AEROTROPOLIS for Mexico City. It is nice to see when an old airport can be completely built from scratch so to speak and come out looking like this. It is something that looks like you would see in Asia. Yet save for what Denver International is already. it looks exactly like Abu Dhabi’s New Mid-Field Terminal, due for completion 2017. This is not just amasing, but this is a wonder of present generacion of airports. Rodney Marinkovic & Flaying Team. SERBIA.